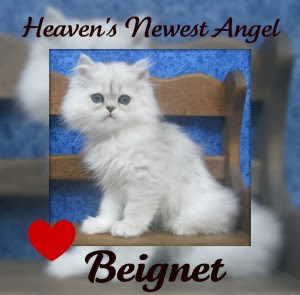 Sweet little Beignet went too the Bridge way too soon at 11 weeks of age. 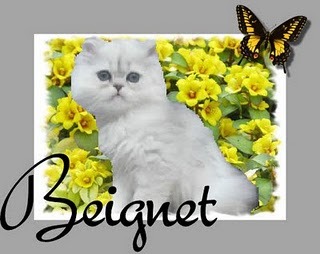 He was a handsome, bouncy, healthy baby mancat until two weeks ago after his first vaccination. Unfortunately he developed cancer - vaccination associated fibrosarcomas (VAS) from this booster shoot, and he died on the operating table during the second surgery. He never even got to come home to live with me, but I loved him so. He's now at the Bridge with Sweet Praline. A special card from Mom Karla, who lost Miss Peach on August 22, 2011. 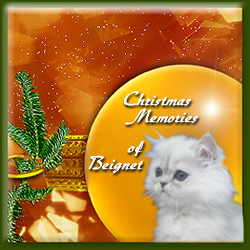 Memory Slide Show for Beignet designed by Mom Paula. Mom Paula playing the piano in the background.